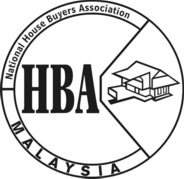 The National House Buyers Association (HBA) acknowledges the challenges faced by the prime minister in tabling Budget 2017 in view of the slowdown in the global and regional economies and steep drop of the ringgit. HBA’s wish list to stem excessive speculation in the property sector that had caused the unbridled escalation of property prices will remain. We must also continue to challenge some ill-concocted ideas that may prey on the government’s laxity. It was for this purpose that HBA accepted the Ministry of Finance’s invitation early this month to table a paper entitled Affordable Housing: How the Rakyat could own it? in a focus group dialogue with all stakeholders, both government and private. The government now seems to be serious about doing something. If so, it has to make several hard and unprecedented decisions. We presented ten pertinent proposals towards affordable housing. HBA has consistently called for government intervention to prevent a “homeless generation of young adult Malaysians” from emerging, especially in urban and suburban areas, who, if not for wild speculation, would be able to buy their own houses. manipulate property prices with conniving cash-strapped housing developers. • Speculative: Those who buy to “flip” and make money against everyone’s interest except their own. The less affluent, who constitute the majority of the population, have been marginalised, while those having more than others accumulating properties far in excess of their needs. 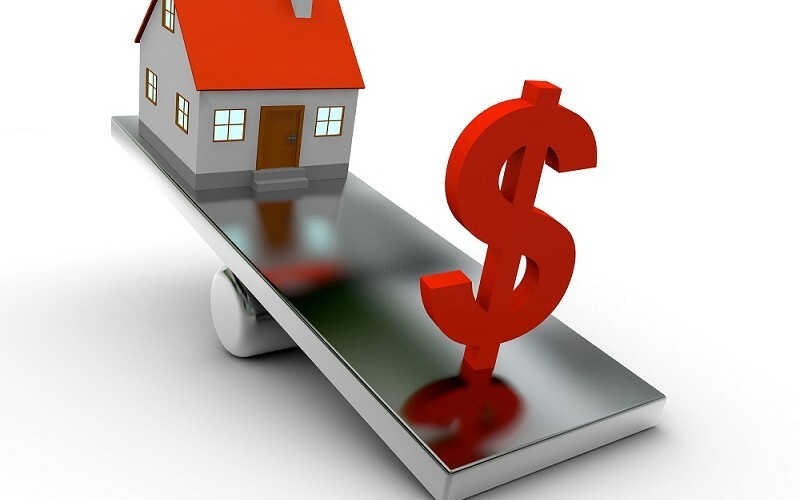 Kudos to the cooling measures adopted in Budget 2014 in the form of Real Property Gains Tax (RPGT), formerly known as the Anti-Property Speculation Act, tightening of the loan to value ratio (LTV) and the ban on Developers’ Interest Bearing Scheme (DIBS), we see property prices slowing down to a certain extent. HBA reiterates its call on the government to take additional measures to continue to stem the steep rise in property prices. The exit cost in the form of RPGT imposition is in place. The government must now relook our proposal to increase the entry cost. While Budget 2014 increased the exit cost in the form of higher RPGT, more measures are needed to increase the entry cost to further reduce multiple purchases by speculators. The current stamp duty payable for transfer of properties is based on the property’s value. This does not deter speculators as the stamp duty payable is the same regardless of the number of properties already held or bought. The government’s current low stamp duty regime has been misused by speculators to accumulate multiple properties, driving up these prices by creating false demand and denying genuine first timers the opportunity to buy such properties. It is every Malaysian’s wish to buy at least one property in their lifetime for their own dwelling, and perhaps an additional property as a long-term investment or to fund their children’s education. 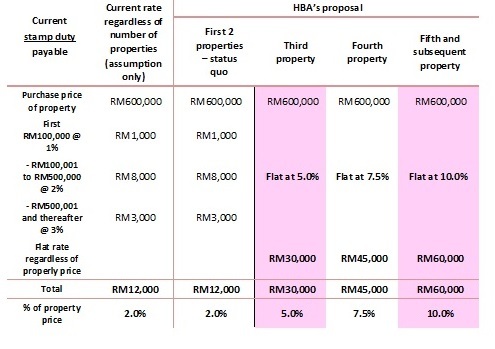 Hence, HBA has proposed that the stamp duty’s current scale remains for the first two properties bought, but is to be increased to a flat rate based on the property price for the third and subsequent properties to discourage speculative buying (see Table 1). cent for the fifth and subsequent property. It would not disrupt genuine house buyers who can afford two properties in their lifetime (one for their dwelling and one for long-term investment). On the other hand, speculators would be discouraged as the stamp duty greatly increases their entry cost. Every now and then, some cabinet members or others accept developers’ arguments to reintroduce the Developer Interest Bearing Scheme (DIBS) gimmick. It should be noted that Bank Negara Malaysia had outlawed “any form of interest capitalisation scheme”. It is every Malaysian’s wish to buy at least one property in their lifetime. organisation that represents developers. This time around, they say it’s only for “first-time house buyers”. For the housing industry’s betterment, DIBS or any other permutation similarly “schemed” cannot be allowed to continue as it risks creating a property bubble as the property prices have been artificially increased and they create a snowball effect. The DIBS prohibition announced in Budget 2014 had been effective in curbing the unbridled escalation of house prices. DIBS must continue to be outlawed and not reinstated in any form or substance. Pay nothing to own a house? pay for anything during construction is specious – attractive to the unwary, the naïve and first timers. Expenses, in any form incurred by the developer, will eventually have to be paid back somehow or other by the purchaser with “premium”. The increased amount, ranging from 10 per cent to 20 per cent and even as high as 25 per cent, will have to be paid by purchasers in exorbitant instalments. DIBS period corresponds with steep increase in property prices A Khazanah Research Institute report showed the Malaysian all-house price index grew steadily at a compounded annual growth rate (CAGR) of 3.1 per cent from 2000 to 2009 and suddenly accelerated at a CAGR of 10.1 per cent between 2009 and 2014. The proposed setting up of HGC will be seen as a “licence” for developers to recklessly launch new housing projects in huge volumes regardless of their viability. Going forward, developers know they can abandon the projects should things turn bad and HGC will take over the project and “mop up” the consequences of abandonment. It will be a clear example of “profits privatised – losses nationalised”. The government should not waste resources to formulate a HGS purportedly to “save” house buyers. Who is paying for the insurance premium? Would it not be factored into the sales price – again? The first question the government needs to face is why does abandonment of housing projects take place? The problem with enforcement is not because of the lack of laws but because of the lack of or lax in enforcement. Enforcement programmes must be organised and implemented. To sit back and expect the housing developers to toe the line is but an elusive dream. Houses are already priced too high for the majority of genuine buyers. The 1Malaysia People’s Housing (PR1MA) programme is a noble idea, but is it being properly implemented? Are they building the right product, at the right place, with the right pricing and of the right numbers? Why should second-time house buyers be eligible to ballot when there are not enough (built) for first timers? 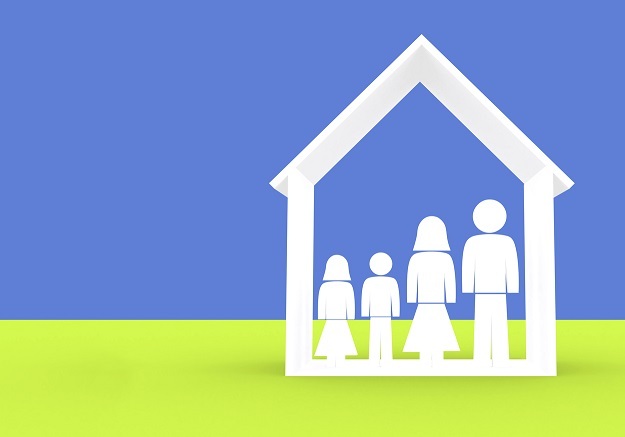 How can affordability be further improved? (a) Increase supply of affordable housing at the RM150,000 to RM300,000 range at the right locations and of the right numbers. (b) Affordable property must only be sold to first-time house buyers and not owners of existing properties. (c) Government agencies entrusted to build affordable properties should only build affordable properties and not lifestyle properties that PR1MA is embarking on through their joint venture with private developers. Even PKNS and some state economic agencies are embarking on building multimillion ringgit bungalows instead of affordable properties and have deviated from the very purpose it has been established. (d) No resale within 10 years moratorium. We have made repeated suggestions and seek answers whether it has been implemented properly whenever confronted with PR1MA representatives but each time to no avail.